I love this purse, it’s pretty cool. I’d love to win this for myself (and hope my daughter doesn’t think it’s an early Christmas present for her!). I have always wanted a Disney Dooney and Bourke bag, and I would love to win this one! I would love to win this for myself. I have always admired the Disney Dooney and Bourke Bags but could never talk myself into purchasing one. I would love to win this for myself but I would probably end up giving it to my daughter!! I would love to win this for myself! I’ve always wanted a D&B and this would be the perfect one to start with! I would love to win this for myself. I always look at them when we go but will never spend the money on myself. I would really love to win this for myself. However, I would give it to my aunt who has been a Disney lover for many, many years and would NEVER spend this amount of money for a a purse for herself! She would be just as excited as me to recieve this bag!! This would be a gift for that someone special. Imagine the husband points I could win here ladies….. I would LOVE to win this to use at our upcoming trip to WDW in 40 days!!!!! LOVE DIsney Dooneys! This particular one would probably go to my MIL, tho. I love this purse! I would definitely be keeping it for me! i would love to have this purse for my upcoming trip to Disney World. Maybe this makes me selfish, but I want the purse for myself! I love it! Who wouldn’t want it for themselves? I’m a bit Disney obsessed and I love the purse! I’d love to win it for myself!! :) Thanks for the chance! I would love to win this purse for myself! I always have wanted one! I’m selfish…I totally want this for myself! I would give it to my goddaughter as her first grownup purse! I love this purse and have wanted one for a very long time!! I think I would keep this for my self, but I also might give it to my mom, she has been through alot health wise and I think it would brighten her day! Thanks so much for this chance! Great contest!! Love the purse, and I’d keep it for myself. Move always wanted one. I’m sharing on my Facebook! I would give this to my Mom if I won. I love Disney, but she loves Disney AND Dooney & Bourke! I always wanted one the their bags – so beautiful but so expensive. The designs are so amazing and they only get better. Whoever wins will definitely enjoy their little piece of Disney everyday. I would love to win this for my mother. She loves Disney and wasn’t able to go with us this year. This would really cheer her up. These purses are my weakness! I do not have this one and I would love it! I really love this cute little purse! I’d love to win this for myself since I’ve been wanting one of these for awhile but can’t afford it at the moment. Besides, I’m the biggest Disney nut that I know within my family & circle of friends (although there are a couple who’d come in a very close second). My daughter and I love Disney D&B. I would love to be able to win this for her birthday! She would be so proud!!!! I’m no Pinocchio…It would definitely be for me!! I would like to win this for my daughter. She is crazy for Disney, and Dooney & Burke. She would really like this purse since it is both of them. Fingers crossed that I win! I would love to win this purse for myself. I’ve never owned any Disney bag and I am a gigantic Disney fan!! I would love to win this. I am going to be selfish and say this is for me. I have the larger black charm bag and this would be a perfect compliment to it. This one would be for me. I am not usually a purse person, but there is something about carrying around some magic to make your day! Would love to win this!! Always dreaming of going to Disney. I would love to have this bag. It would be perfect for my upcoming Disney trip this summer. I am going to Disney for my first time this year! ( I’m 38! ), and I am sooo exited! I would love to win the pose to take with me :)! 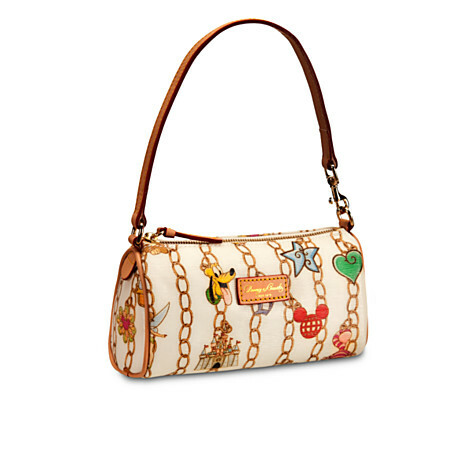 Oh man, I would so love to win this sweet Disney Dooney! She is just beautiful!! The nice thing about this size though is that I can “let” my daughter use it once in awhile, even though it would really be for me, LOL!! Thanks for this great opportunity! I want to win this ourse for my grandma!! I’d love to win it for my daughter to take to Disney when she travels there this summer! I would love to win this for myself and for my daughter to share on our trip to Disney in June! We love Disney and this would be my favorite giveaway by far!! Thank you! I love Disney Dooney’s!! This is all I carry. This little piece of Pixie Dust would be a Grand addition to my collection!! Thank you kindly for your contest !! FUN!! I’d love to win this for myself! It would be perfect for carrying in the park on our next trip! I would love to add to my collection! I do not have a small one yet this would be nice! Love this! Would love to keep it for myself or for my daughter. I would LOVE this! please oh please oh please!! I love this bag. I carry a Lesportsac purse everyday and get so many compliments. Would love to have a Dooney. LOVE this purse! WOW! It’s been a dozen years since we’ve been to Disney, but hope to make it there again soooooon! Thanks for the giveaway!!! I love these purses and want to win this for me :) ! I would like to win this bag for myself because, I never ever buy anything for myself. My house and my family always comes first. This would be a great Happy Birthday present to me. Sorry if I sound coincided. Thank you for giving all of us the opportunity to win this fabulous bag. I am lucky and I can want to win this purse for myself and not feel guilty! I have one child..a boy, a husband, 6 brothers and 5 nephews! My ma is the only other girl (still in the family!) and she would not use a purse that small! definitely myself! I dont remember the last time i had a new bag that wasnt a diaper bag! I think for me, I have never owned a name brand/designer bag.. I usually get whatever is cheap and cute at Marshall’s or Sears or even a thrift store. But if I feel too guilty about owning it, maybe I would use it as a prize at a Diva event. Maybe a raffle to raise funds for Give Kids the World or something?? I would love to win this for my mom, who is a newly minted Disney fan, and always admires these beautiful purses but never allows me to buy her one. She is one of the hardest workers I have ever seen and I think she would love this! Would love to win this for myself! Saw this at Downtown Disney last week and started to drool! Absolutely love this purse! I have always wanted a Dooney bag .Would love to win this one but I will have on some day!! My DS is the only person I know who is more passionate about Disney than me. I don’t think he would want it, so I guess it would be mine! :) Yeah!!! As much as I’d like to be self-less, this time I’m hoping to win this for me! My mom has always admired this purse. She can barely take her eyes off of them. It would be a wonderful birthday present for her! I’d love to win this for myself as a little treat and bit of daily disney brightness in my day since both money and my health have been less than great right now. It’s for my wife. She deserves it. She would never spend this much money on a purse, so I wish she could have it. I don’t have a million purses for each day of the week, actually only have one. But if I won this I would definitely keep it to use, it is adorable. I would love to win this purse! Thanks for opportunity to win it! I would love to win this for my mom! She loves Disney and we haven’t had the chance to take her back in a few years. What an awesome Mother’s Day present!! I would love to win this for myself. I have another Disney Dooney & Bourke and I love it. This purse is a perfect size for me. I would love to win this bag! I never spend the money on myself to buy good purses. My current purse is a $16 thrift shop buy, and the zipper is totally broken right now. I’ve been holding off on replacing it because budget is tight with our upcoming WDW trip. Winning this one would be awesome! I wish that I could win this Disney, Dooney and Burke Purse. i wanted to but one when we were at DisneyWorld Sept, 2012, but I couldn’t afford one. It would be Awesome if I won !!! Yey Mickey !!! I want this bag for me!! I love Disney and dooney!!! Love this bag! Would be great to take on our yearly Disney trips!! I want to win this for one of my dear friends who will be having surgery in 2 weeks to remove a tumor in her brain..I HAVE all faith she will do GREAT!! and would love to give her this!! SHE is truly the ultimate Disney fan..
id love to have this bag for myself! I love Disney dooneys but I love this design more than most because Pluto’s cute face is front and center :) he’s been one of my faves since I waz little! my sister is getting married in June and going to disneyland for her honeymoon. This would make such a fun shower gift for her! I would love to win this for myself! I love Disney and have been working hard at my new job and deserve this amazing purse! I’d like to win this for myself, it’s super cute! Love the bags and the contest. Would love it myself but know a niece who would really love it. However, I feel discriminated against as I don’t pinterest or twitter so I lose points. I would like to win this for my Sister!! I would love to win this for BOTH my daughter AND myself! I would love to win this for me!!! I would love to win this for myself! Mommies need gifts too! I would love to take this on my Disney cruise! I would love to win this purse for myself! My husband bought me a bigger D&B bag in a different print for my birthday 2 years ago, so I’d LOVE to win this one!! I would love to win this for myself!! I love Disney and DROOL over the D&B bags!!! I would love to win this purse – I love Pluto and I have not bought a new purse for myself in years. (Though I would definitely be sharing it with my 6 year old daughter). I would love to win this Dooney! I I don’t own one yet and its my dream!!! This’d be my first Dooney! Love it! Thanks for the opportunity! person knows they don’t have to give a lengthy explanation for your decision. She could give and receive freely. Previous Post: 88 Days til Disneyland – Indiana Jones Adventure! Next Post: 87 Days til Disneyland – Walt Disney’s Enchanted Tiki Room!